We live in a multipurpose, multitasking world. Cell phones are now computers, capable of performing thousands of tasks. Printers come with fax machines, copiers, and scanners built in. Trains equipped with wireless internet allow commuters to work on their way to and from the office. Couches fold out into beds; pool tables convert into ping-pong tables. It’s no surprise that in such a world, in-ground pools are often built with in-ground hot tubs attached. On one hand, such multifunctionality provides clear benefits by saving construction time and cost; on the other, combining functions can markedly reduce functionality. Sure, you can play both pool and ping-pong on a combination table, but neither experience will quite measure up to playing pool on a real pool table, or ping-pong on a table specifically designed for the game. The same principle applies to combination in-ground pools and spas. Combination pool and spas come with benefits, sure. Pool-lovers also get a spa; spa lovers get a pool. Installing a spa and pool as part of the same unit can save on upfront construction cost and time, and is easy to unify in a harmonious design. On the surface, it seems like a win-win situation. However, the combination comes with costs to consider. Location. In a combination pool and spa, the placement of the spa is inflexible, as it must be located in the immediate vicinity of the swimming pool. That’s not always going to be the best spot for it. In fact, to encourage ease of use, spa owners often prefer to place their hot tubs very close to the back door. This way, even on cold winter days, their warm hot tub is just steps away. Performance. In-ground hot tubs tend to have less energetic pumps than those that power portable spas. Particularly in premium and luxury spas, the jets are more numerous and are placed deliberately to provide a deeper, more invigorating massage. Comfort. In-ground spas feature bench seating, which is uncomfortable and inflexible. Portable spas, on the other hand, offer a wide array of comfortable and ergonomic seating options. Convenience. Combination hot tubs must be heated up prior to each use. This requires more energy than portable spas, which maintain a constant ready temperature. In addition, heating up water causes a significant delay before the owner can use it. This delay can discourage regular usage, as it makes fitting a daily soak into your routine more difficult. Operational Costs. In part due to needing to be heated up each time they are used, in-ground spas use energy less efficiently, resulting in higher monthly bills. While it may seem like a combination spa and pool is a great idea, these additional considerations should give homeowners pause. To be sure they’re getting good value from both their pool and their spa, they need to consider the pros and cons when contrasted with other options. Energy Efficiency. Standalone hot tubs are more energy efficient than combination, because they’re able to maintain their temperature between soaks, and have custom-fitted covers and top-of-the-line insulation. This vastly reduces energy costs for an always-ready spa. Features. 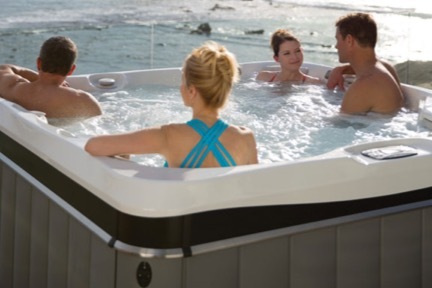 Luxury portable hot tubs are more likely to have ergonomic seating, numerous jets, and intuitive, easy-to-use controls. The customizable jets will deliver a more soothing (or invigorating) massage, powered by strong pumps. Premium and luxury spas also often include entertainment options, multicolored lighting, and waterfalls. Ease of Use. An above-ground spa can be located feet from your back door, or underneath a shade. This promotes regular use, even on cold or rainy days. Also, accessories like cover lifters have been designed to remove your hot tub cover with a minimum of effort and store it safely off the ground. Backyard Flexibility. Keeping your pool and your spa entirely separate allows for more flexibility in the design of your backyard oasis. For example, your spa can be located on or in your deck, while your pool lies down a garden path from your deck’s stairs. Your children can play in the pool while you relax in the hot tub, enjoying your calm retreat. When you’re deciding whether to install a pool with a built-in spa, take a moment to consider the implications. Would you rather have a pool with a mediocre spa attached to it, or a pool and an excellent spa in separate locations? Installing both—an in-ground pool and a portable spa—enables you to get the best from both your hot tub and your pool. It gives you the option to choose the spa that’s perfect for you—not the one that comes as an afterthought. Hot SpringⓇ Spas, CalderaⓇ Spas, ArtesiaⓇ Spas and FreeflowⓇ Spas are the hot tubs for hot tub people. Coastal Spa and Patio’s line up of premium and luxury spas are built with top-quality components, maximizing energy efficiency and durability. Strong pumps provide pressure via dozens of hydromassage jets. Ergonomic seats keep you comfortably in place as you melt into your warm soak. Entertainment options provide the perfect mood for solitary relaxation or social get-togethers. 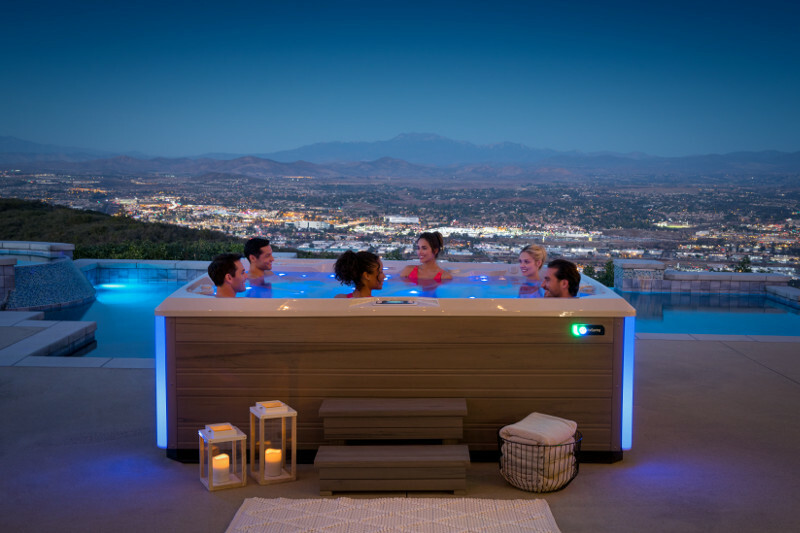 If you’re looking for a hot tub, don’t go halfway—go Coastal Spa & Patio. Click here to download our brochure!